ingångar till dess 2 HDMI utgångar och HDBaseT utgång med tillhörande ljudsignaler till skärmarnas "native" upplösning. Denna presentations switchen har också en digital "bypass" funktion som gör det möjligt att att skicka HDMI signalen från vilken input som helst till en dedikerad HDMI utgång. stöds via en inbyggd DAC ( Digital to Analog Converter ) och ADC ( Analog to Digital Converter ) vilket erbjuder en flexibel lösning för ljud. EL-5500-HBT är en perfekt lösning för varje situation där man behöver koppla in källor med olika kontakter till 2 HDMI skärmar. 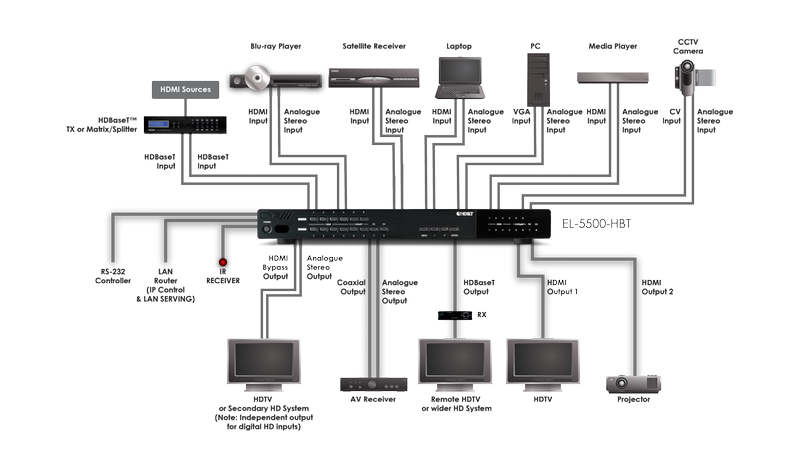 ?The EL-5500-HBT is an advanced rack mountable HDBaseT, HDMI, VGA, Composite, and Component presentation switcher. This device can scale and switch eight input sources to it's two HDMI outputs and a single HDBaseT output, with their associated audio signals to the native resolutions supported by the connected display. This presentation switch also features a switchable digital bypass output allowing any HDMI or HDBaseT input to be directly bypassed via the HDMI bypass output. Control is via the IR remote, RS-232, IP, or via manual selection buttons. Both digital and analogue stereo audio is supported via a built-in DAC (Digital to Analogue Converter) and ADC (Analogue to Digital Converter) providing flexible audio signal integration. The EL-5500-HBT is the perfect solution for any educational or commercial environment requiring integration of multiple sources and signal formats to two HDMI displays.